[vc_row][vc_column][vc_column_text]Emily has a diagnosis of Central Core Disease (a rare neuromuscular disorder) & blateral hip dysplasia. Emily experiences significant general weakness, particularly in her legs & to a lesser degree to her upper limbs. Emily has 98% scoliosis which required her to have an extensive spinal operation to insert a steel rod into her spine. We received a great email from Emily’s family. “Our family would like to thank you and the John Maclean Foundation for your kind support of the $5,000 grant to help fund Emily’s new Electric Wheel Chair. The help you have given is so much appreciated. We have had a big year with surgery, raising money to buy the new van a new walker and with out your help we would have struggled to get the chair. 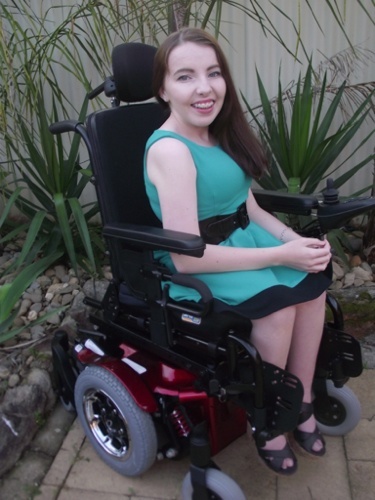 We received the new a chair Zippie Pulse on Monday 2nd Sept 2013 and Emily is very happy with it. Not only does Emily have a beautiful smile, we’ve been told that Emily also has a beautiful singing voice. We look forward to hearing it, hopefuly one day soon”.